I recall when contact paper hit the market, my mother bought up ALL of the DARK-WOOD grained paper available, or so it seemed. Then she had us cover every piece of wood in the house. The 4 beds, headboard/footboard, every dressor in the house, kitchen shelves. Then we got to put it on the sink in the bathroom. Dad got carried away and wanted to "COVER" the stationwagon. He said, let's make it look like a "WOODY". (He didn't win on that one!!) Ya know, my sons slept in those same twin beds. The contact paper lasted longer than my marriage!!! 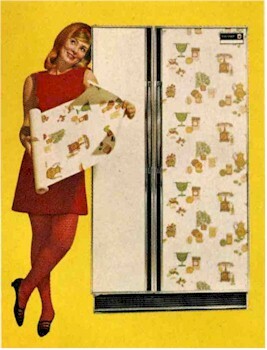 My ex-wife was a contact paper queen. Shelves, cabinets, appliances, drawers, ...anything. 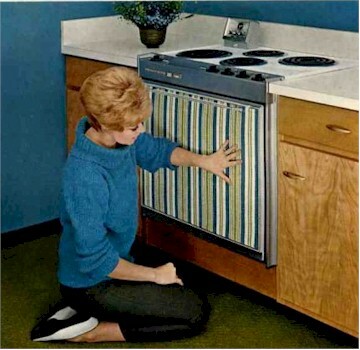 When a woman starts wallpapering her appliances, maybe she should consider working outside the home.